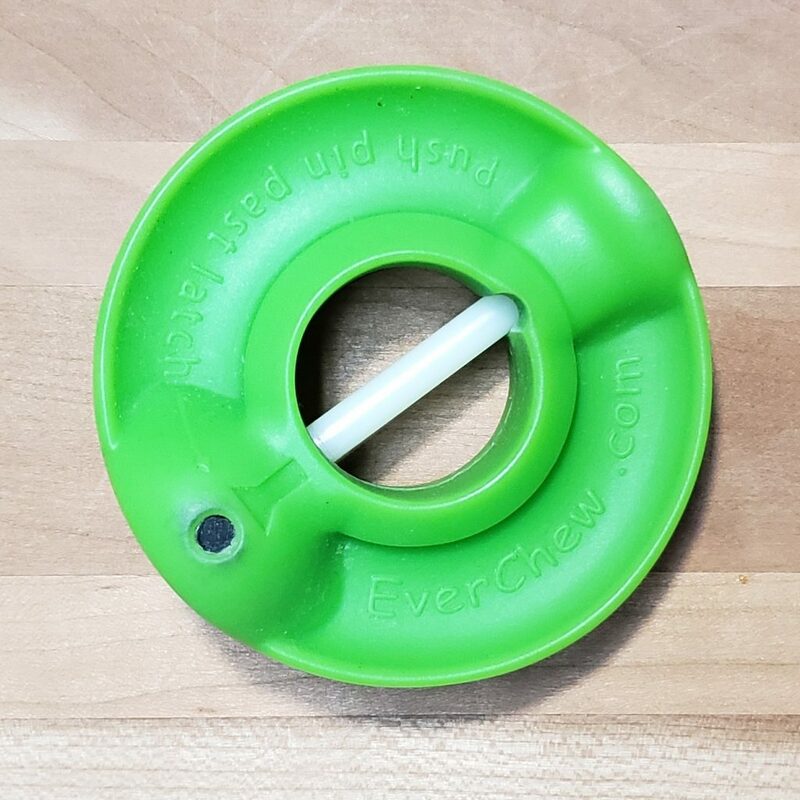 Everchew keeps dogs safe from choking (and busy for a long time) by locking dog chews into the undefeatable (and easy-refill) rubber ring. 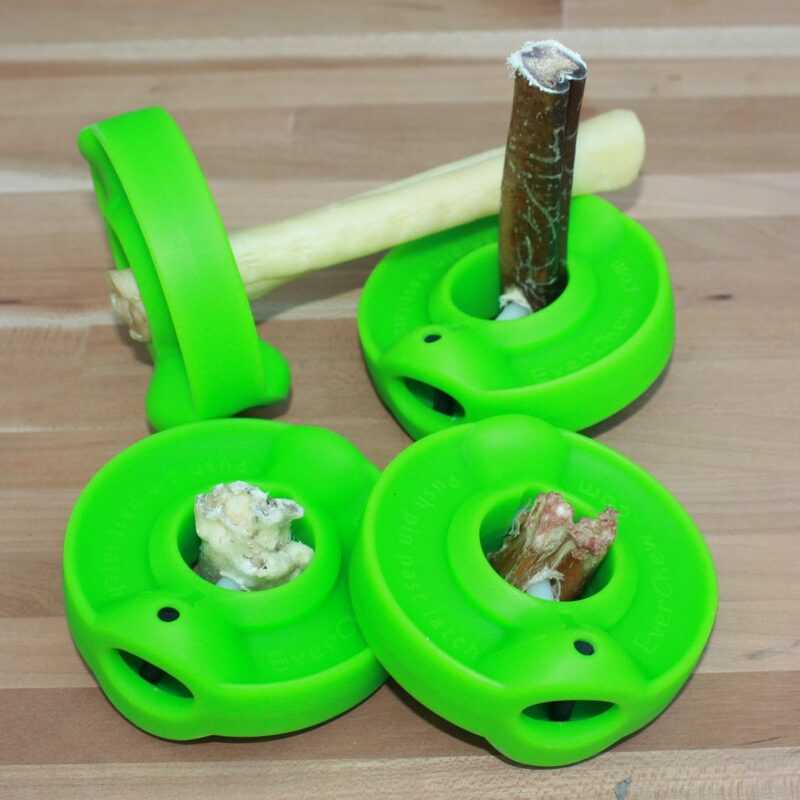 EverChewTM is the dog chew holder that not only keeps your dog busy for longer, more importantly, it prevents choking. 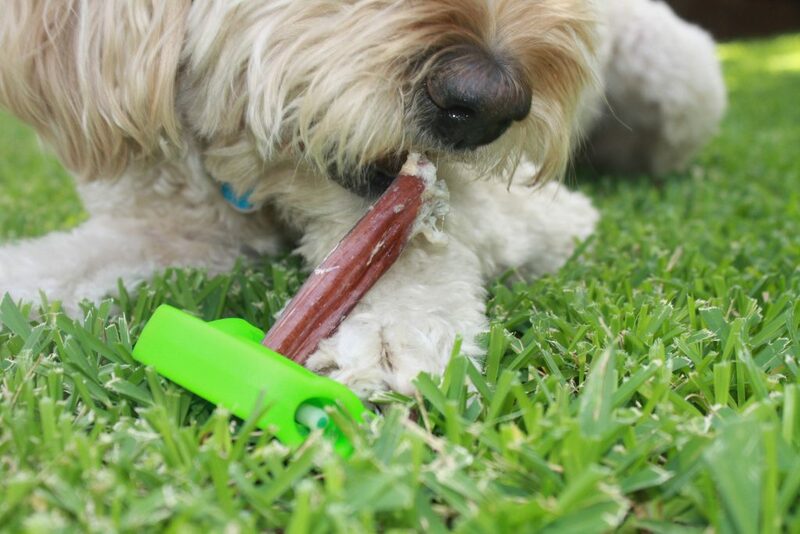 Your dog must slowly tear the last part of the chew from the holder in soft, wet, safe-sized pieces. The ring is a non-toxic, high quality rubber that’s safe for your dog’s teeth. How does EverChew prevent choking? When bully sticks and rawhide dog chews get eaten down to a smaller piece, dogs can gulp the chew bone down. When dogs swallow a chew stub, it can get lodged in the dog’s throat or become an obstruction deeper in the digestive system. Everchew uses a nylon pin to lock the chew into the ring. Is the plastic in the Everchew safe? Yes. The ring is made up of three plastic parts. Two are rubber (the ring and the latch), and the pin is nylon. The rubber parts are naturally tooth safe, and the nylon pin is the same plastic that’s used in nylon dog bones for chewing. And the best thing about the design is that the dog’s teeth can’t bite the nylon pin anyway. It’s deep in the rubber ring. Also, the plastics have no adulterants or additives. Everything, even the raw rubber used to make the ring, is made in the USA. How long do the safe dog chew treats last in the ring? Dogs generally eat the part of the chew above the ring at their normal eating rate. However, things get interesting when your dog eats the chew flush to the rubber ring. With a rawhide, the dog can slowly try to pull it out in small, soggy pieces. About half the time, our dog Eva is able to get out all the chew, but it takes her 1-3 hours of working on that last, trapped 1” stub of rawhide. Bully sticks don’t tear as well as rawhide, but she really tries to get the last chew bone stub out as well. About 25% of the time, the bully stick stub will tear out in small pieces. If your dog can’t get the dog chew treat out, just remove it and replace with a fresh chew. Why didn’t you just clamp the chew somehow? Every clamping design was defeated in testing—except the ones made with metal clamps. But no one should ever use metal in something a dog chews on–it can break their teeth or tear up their digestive system. That’s how we ended up using a plastic pin with a double action rubber latch. The advantage of this latch design is that it needs no tools; works well for fingers with long nails, weak fingers, and fat fingers; and you don’t need a strong grip to twist tighten it. Is the ring dishwasher safe? Yes, and the pin too. I bet my dog will destroy that ring! Yes, if your dog is a super chewer (or is named “Gator”) the ring will eventually be torn apart. The ring is made from a thermoplastic elastomer with a higher tear strength than most dog toys. But EverChew is a ring that holds the chew bone–it is not the chew toy itself. Therefore, we trained Eva not to chew on the ring, and she quickly learned that the good flavors were trapped in the center. Now when she sees an empty ring she may just lick it checking for hidden flavor, but she doesn’t just treat the EverChew ring as a chew treat. She has squeaky ducks and other chew toys that she gets to tear apart. Is EverChew made in USA? You bet it is! We only want the highest quality materials and production methods for your dog and puppy. Therefore, every component that goes into the EverChew ring is made in USA! Even the raw rubber material that the injection molder uses to make the ring is made in the USA especially for dog toys. If you need anything, email Kirby: info@EverChew.com. EverChew is trademarked and patent pending.